The Milmega Series 2000 Amplifiers have an award winning innovative design which implements the latest GaAsFet and MIMIC technologies. This has provided an architecture which facilitates some unique features and benefits which differentiate them from other Solid State Amplifiers. 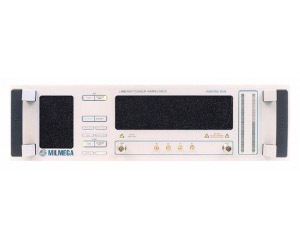 Milmega Series 2000 have an impressive array of input/output and sample port options and costeffective power or bandwidth upgrades. Features: Noise figures typically < 6dB. (8dB max) Gain variation with frequency ±2.5dB. Gain variation with temperature < 0.06dB/C. IP3 typically 10dB > P1dB. Harmonics -20dBc min, Spurious (Max) -70dBc Spurious (typical) -80dBc Up to 200 watts in a single 3U unit. Consistent over greater than octave bandwidths. Power output to 1kW and greater. Includes all-inclusive five year warranty.